Trains will run on the Silver Line for the first time since a historic storm shuttered the line for several days. Metro trains will continue to run every 8 minutes on all six Metro lines starting at 5 a.m. Thursday. Trains will run every 4 minutes at stations served by multiple lines in downtown Washington. Metro says extensive snow and ice removal over the past 72 hours allowed the agency to open the final five stations on the Silver Line. Metro buses will run on a "light" snow plan Thursday. All routes were in service as of Wednesday afternoon, but snow detours will be in effect due to narrow streets and icy conditions. See Metro's website for light snow routes. MetroAccess service was restored Tuesday and will be available again Thursday. However, some door-to-door service will not be possible because of road conditions. Metrorail service resumed Tuesday on most of the system's lines, but the Silver Line remained closed while shuttles ran between four Orange Line stations. Metro trains ran every 12 minutes on each line and regular fares and parking costs were charged after 9:30 a.m. Tuesday. The system was closed for two days after a historic blizzard dumped 2 to 3 feet of snow on the region. 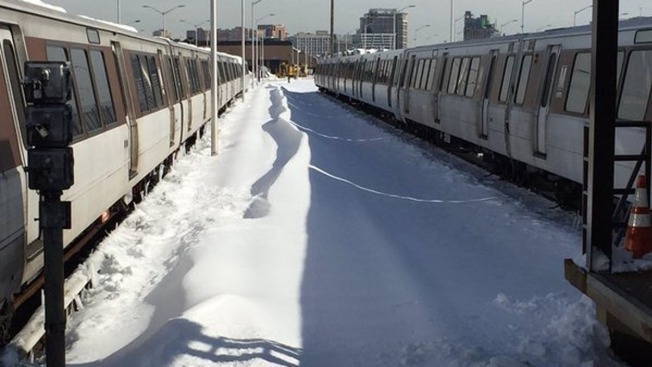 The final five stations on the Silver Line were not served Tuesday, as they were some of the hardest hit by the snow, Metro General Manager Paul Wiedefeld said. The Vienna, Dunn Loring, West Falls Church and East Falls Church stations on the Orange Line also were closed Tuesday after crews discovered weather-related damage overnight. Shuttle bus service ran between the four stations. "We don't want to put people out there and then get them stranded," Wiedefeld said Monday. "That's why we are taking our time and getting this right." Metrobuses were operating Tuesday on a "severe" weather service plan -- upgraded from "lifeline" service, Wiedefeld said. Service was available on 79 regional routes, only on the busiest portion of the route. Special equipment clears snow and ice from Metro rails, News4's Adam Tuss saw at Metro's railyard in Alexandria, Virginia. More than half of Metro tracks are above ground and outdoors.